This excursion is forbidden under 3 years old and not recommended before 5 years old. We love Dogs too, but they're not allowed. Plan on appropriate summare and winter equipment (gloves, good shoes, jacket, pants). Summer star activity: Think about reserving! For more than 60 years, the most famous and one of the highest aiguille de Chamonix has been an essential world attraction. From the centre of Chamonix, a 20 minutes ride with the Aiguille du Midi cable car takes you to the gateway of High Mountain at a height of 3,842 m.
From its height of 3,777m, the Aiguille du Midi and its laid-out terraces offer a 360° view of all the French, Swiss and Italian Alps. A lift brings you to the summit terrace at 3,842m, where you will have a clear view of Mont Blanc. Since December 21st 2013, the more fearless will take A STEP INTO THE VOID, onto a 2.50 m glass cage out over a 1000 m precipice. A product of modern architectural and technical prowess and a sensation packed experience. A long steel gallery of 32m to make the full rotation of the central peak of the Aiguille du Midi. A cafeteria and a souvenir shop are open all year round. In the summer, the "3842m" restaurant invites you to taste Savoie culinary specialities in a unique setting. Once at the top, do not miss the gondola lift ride over the Glacier du Géant to the Pointe Helbronner in Italy. It is open from June to September. The cable car ride between Chamonix and Aiguille du Midi is in two stages. At the intermediate stop, at a height of 2,310m, the Plan de l'Aiguille is the departure point for the Balcon Nord hike to the Montenvers site. Food and refreshments are available at lunch-time at the Refuge du Plan, 5 minutes’ walk away. A very pleasant break in the mountains ! - Provide warm clothing, sunglasses and sunscreen. - Tour forbidden for children under 3 years, and not recommended under 5 years old. 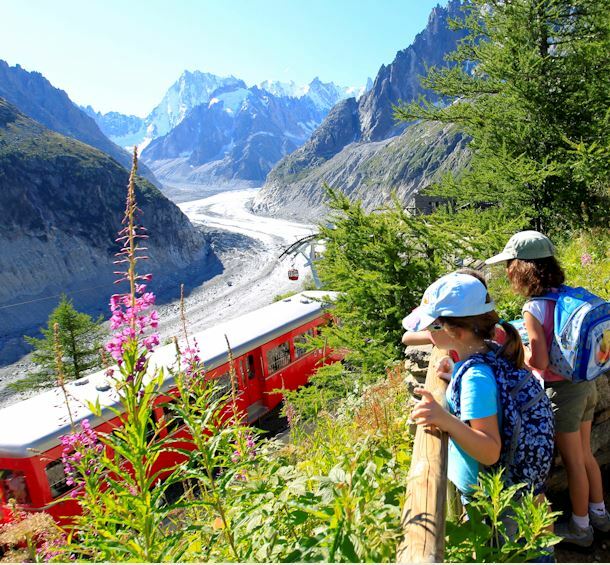 - Time of outward journey: 20 mn in 2 cable cars climbing 2700 m, with a stop on the way at the Plan de l’Aiguille. - Duration of visit: including the journey, allow an average of 2 to 3 hrs. - Timetables and frequency of departure vary according to the time of year and according to demand. Round-trip ticket for a child : 53.60 €.